Keith Combs and I did a presentation on JavaFX and WidgetFX at Silicon Valley Code Camp this past weekend to a packed room (see below for the slides). This was my first time visiting SVCodeCamp and I was very impressed… With a 2 day total of over 1700 attendees, it was the place to be in the Bay Area! Clearly this is not rigged if I had to spin it 26 times! 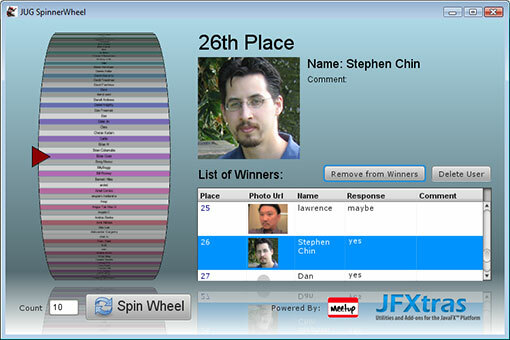 The revamped JUG SpinnerWheel includes a pseudo-3d rendered prize wheel, web service integration to meetup.com to retrieve event participants, and a winner display featuring the prototype JFXtras Table component. We used this for the first time, and successfully gave away 3 copies of the Pro JavaFX Platform book to audience members eager to learn more about JavaFX!